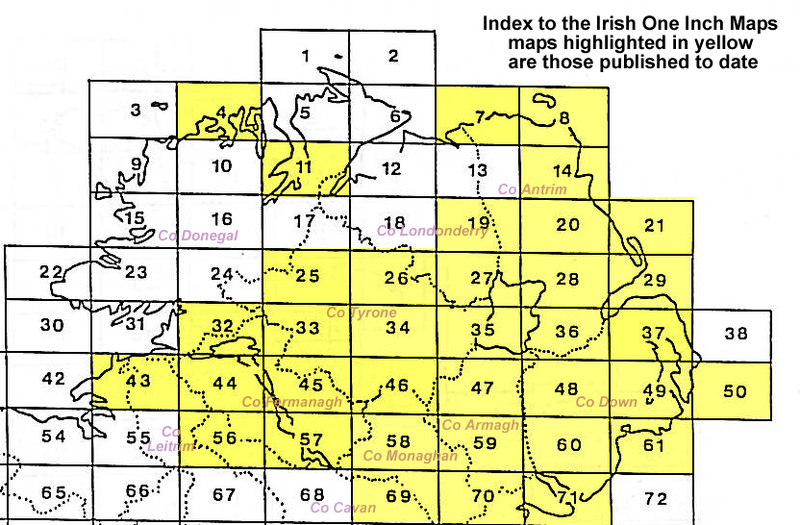 So far we have published more than 50 maps for Ireland. Most of these maps were originally prepared around the turn of the century. As a result all Irish maps, north and south, are here listed as one series, though we may divide it as the series grows larger. The following Maps are highly detailed, taken from the 1/2500 plans and reprinted at about 14 inches to the mile. The Dublin Castle map is even more detailed, at a yard to the mile. see Inch to the Mile maps below for Broughshane and Doagh. see Inch to the Mile maps below for Ardglass, Ballynahinch, Comber, Groomsport, Hillsborough, Saintfield and Waringstown..
see Inch to the Mile maps below for Belleek, Derrygonnelly, Irvinestown, Lisnaskea and Maguiresbridge. see Inch to the Mile maps below for Moneymore. see Inch to the Mile maps below for Carrickmacross. see Inch to the Mile maps below for Augher, Aughnacloy, Castlederg, Clogher, Coalisland and Newtownstewart. These maps are small scale district maps at one inch to the mile but each has one or more large scale plans of small towns or villages on the back. Here is an Index Map showing the approximate areas covered in the Inch to the Mile series.